ASP-DCs exhibit a tolerogenic phenotype. Monocyte-derived immature DCs were obtained from PBMCs of healthy donors (n = 4). 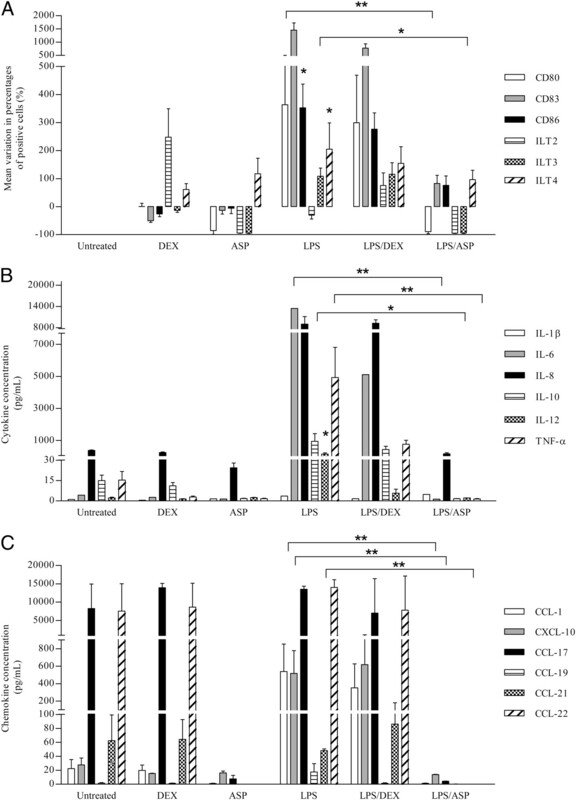 Cells were incubated with medium, DEX (1 μg/ml), ASP (20 μg/ml), LPS (1 μg/ml), or combinations for 24 h. Expression of various costimulatory (CD80, CD83, CD86) or inhibitory molecules (ILT2, ILT3, ILT4) was assessed using specific Abs and flow cytometry analysis (A). Results are expressed as the mean variation ± SEM in percentages of positive cells when compared with untreated DCs. Supernatants were tested for the presence of IL-1β, IL-6, IL-8, IL-10, IL-12p70, and TNF-α by cytometric bead array (B) or CCL-1, CXCL-10, CCL-17, CCL-19, CCL-21, and CCL-22 by ELISA (C). Treatments were compared with controls (unless stated otherwise). *p < 0.05, **p < 0.01 were considered significant (Kruskall–Wallis test). Distinct patterns of tolerogenic genes are expressed by ASP-DCs and DEX-DCs. Human DCs obtained from four healthy donors were cultured with medium, ultrapure LPS (1 μg/ml), DEX (1 μg/ml), or ASP at various concentrations (0.2–20 μg/ml) for 24 h (A) or at selected time points during 48 h kinetics experiments (ASP at 20 μg/ml) (B). Total RNA was isolated, and GILZ, IDO, NOS-2, RALDH-1, and RALDH-2 gene expression was evaluated by quantitative real-time PCR. Data are expressed as relative amounts of mRNA in treated DCs in comparison with DCs incubated in medium alone. Data are normalized to amounts of β-actin and shown as mean ± SEM values. Treatments were compared with controls. *p < 0.05, **p < 0.01 were considered significant (Kruskall–Wallis test). ASP does not induce apoptosis in DCs. Human DCs obtained from four healthy donors were cultured with medium, ultrapure LPS (1 μg/ml), DEX (1 μg/ml), ASP (20 μg/ml), or DNCB (500 μM) for 24 h and apoptosis/necrosis were followed after Annexin V/PI staining. A representative donor out of four is presented in A, whereas mean ± SEM values are presented in B. Differences were not statistically significant using the Kruskall–Wallis test. 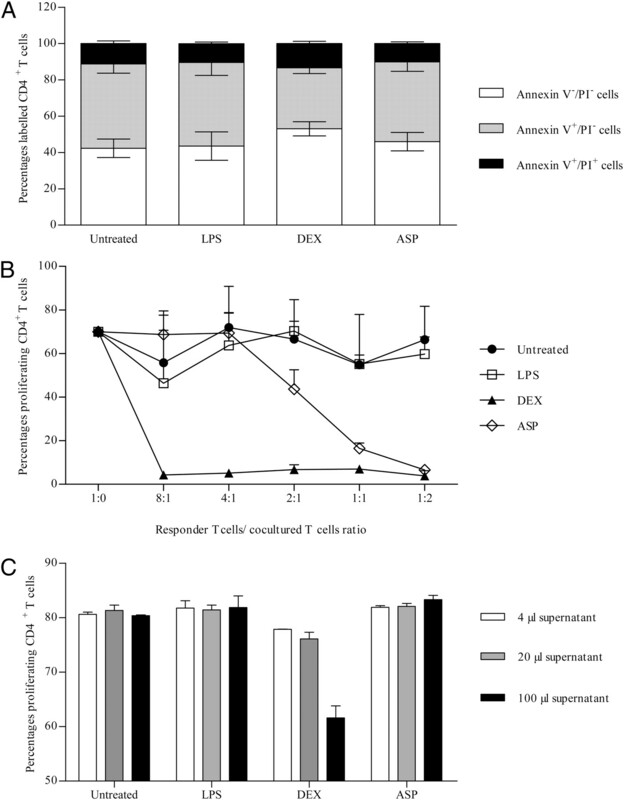 CD4+ T cells cocultured with ASP-DCs downregulate cytokine production and do not express FOXP3. Control, LPS, DEX, or ASP-treated DCs were washed and incubated with purified allogeneic naive CD4+ T cells during 5 d for T cell polarization assays (A, B) and 4 d for FOXP3 staining experiments (C). Cytokine expression was analyzed by cytometric bead array (A) and ELISA (B). FOXP3 expression was followed by flow cytometry after intracellular staining. Data were obtained from four independent experiments conducted with samples from distinct donors. Results in A are expressed as the relative variation of cytokine concentration ± SEM between T cells cocultured with either treated or untreated DCs. Results in B and C are expressed respectively as concentrations (pg/ml) and mean variations in percentages or mean fluorescence intensity of positive cells ± SEM between T cells generated with treated or untreated DCs. ASP-DCs induce a reversible state of anergy in T cells. Cocultured T cells were isolated with Dynal untouched T cell isolation kit after 5 d of coculture. Cells were rested in medium during 2 d, labeled with CFSE, and reactivated with medium, IL-2, anti-CD2, -CD3, and -CD28 beads, or both during 3 d. T cell proliferation was followed by flow cytometry by quantifying cells with a decreased CFSE-associated fluorescence. Representative patterns of CFSE-associated fluorescence are presented in A. Results in B are compiled from four independent experiments with samples from distinct donors. *p < 0.05. ASP-DCs induce nonapoptotic T cells with a suppressive capacity. A, For apoptosis assays, T cells were harvested at day 6 and labeled with Annexin V/PI. 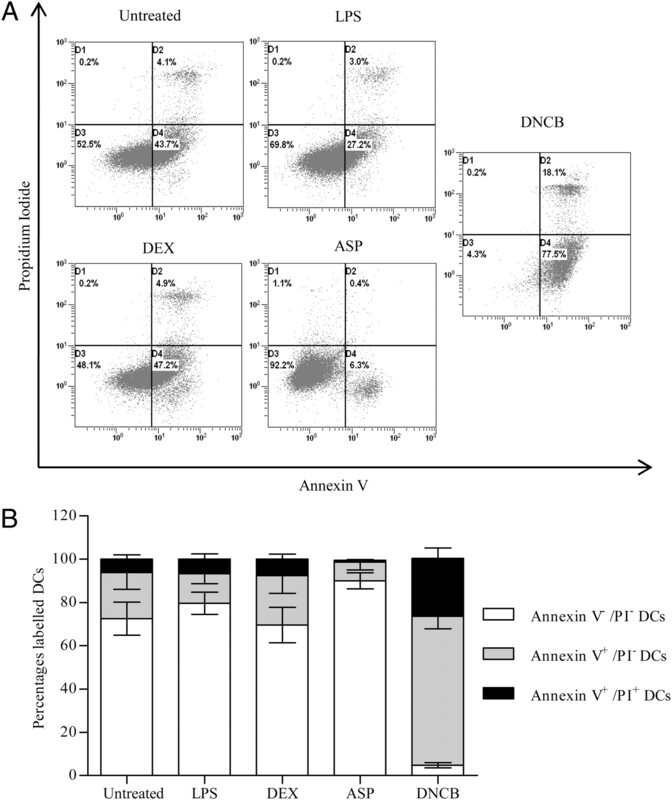 Percentages of PI−/Annexin V−, PI−/Annexin V+, and PI+/Annexin V+ cells were determined by flow cytometry (mean ± SEM using samples from four healthy donors). B, To measure T cell suppressive activity, CD4+CD25− responder cells were isolated using the CD4+CD25+ regulatory T cell isolation kit through collection of the negative fraction. Cells were CFSE labeled and plated with anti-CD2, -CD3, and -CD28 beads (ratio 1:1). Cocultured T cells were added at ratios ranging from 1:2 to 8:1 responder/cocultured T cells and incubated for 3 d. All determinations were carried out in duplicate, and responder cell proliferation was assessed by flow cytometry. C, The potential involvement of soluble factors on T cell suppression was analyzed by incubating CFSE-labeled CD4+ T cells stimulated with anti-CD2, -CD3, and -CD28 beads, with 4, 20, or 100 μl supernatant from treated DC/T cell cocultures. Percentages of proliferating cells were determined after 5 d by flow cytometry. Treatments were compared with controls. 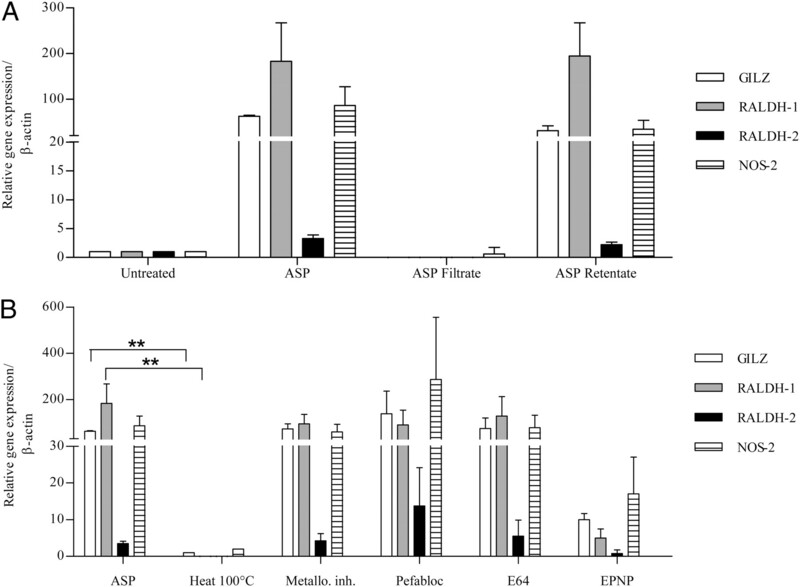 Upregulation of tolerogenic genes by ASP involves aspartic acid-containing proteases. A, ASP was filtered through 10 kDa cutoff filters, and both filtrates and retentates were incubated with DCs for 24 h. B, ASP was inactivated by heating 15 min at 100°C or by incubation with protease inhibitors for 1 h. Specific protease inhibitors used included a mix of metalloprotease inhibitors composed of 1,10-phenanthroline, phosphoramidon, and arphamenine B, the serine protease inhibitor Pefabloc SC, the cysteine protease inhibitor E64, and the aspartic protease inhibitor EPNP. DCs were cultured with medium or treated ASP (20 μg/ml) for 24 h. Gene expression of GILZ, NOS-2, RALDH-1, and RALDH-2 was analyzed by quantitative PCR. Data are expressed as relative amounts of mRNA in DCs treated with either ASP (20 μg/ml) or ASP plus inhibitors in comparison with DCs incubated in medium alone. Data are normalized to amounts of β-actin and shown as the mean ± SEM obtained from four healthy donors. **p < 0.01 (Kruskall–Wallis test). 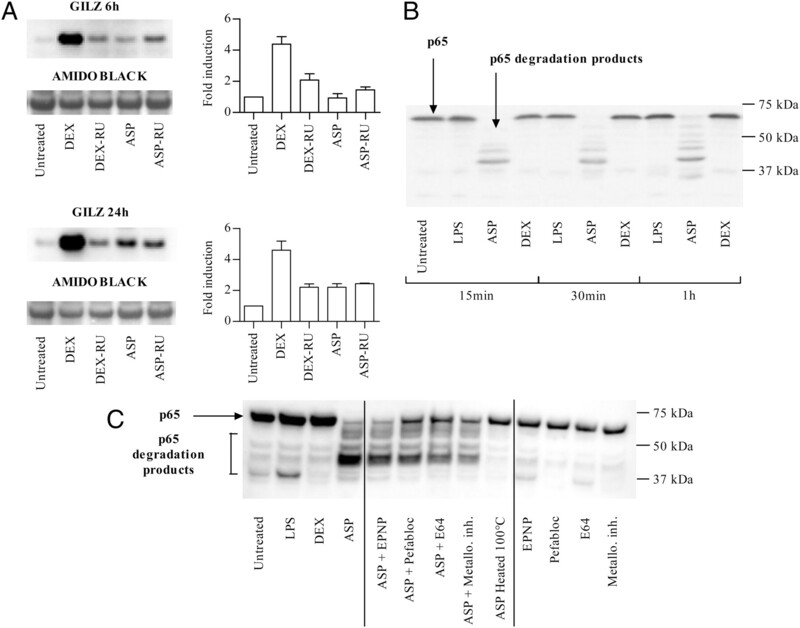 Tolerance induction by ASP is independent of the GR and involves p65 degradation. 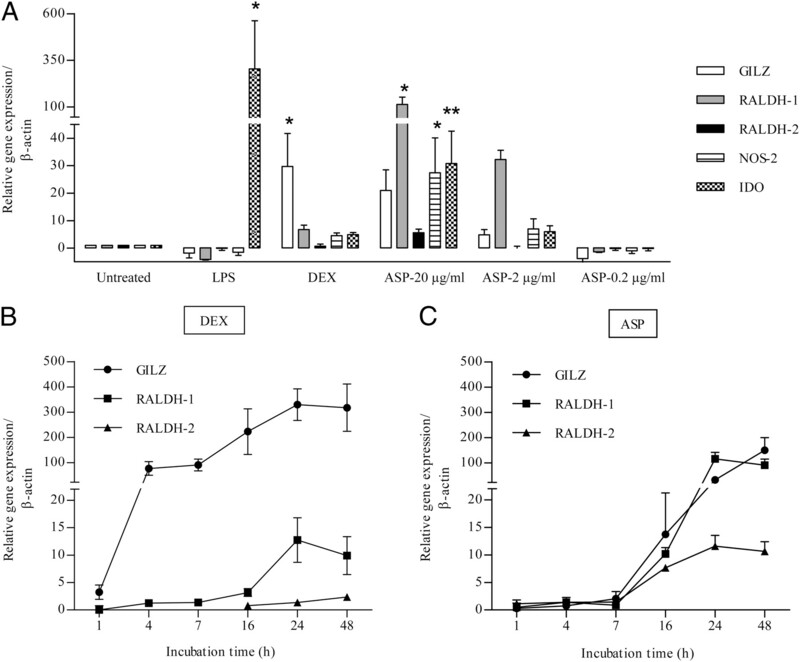 A, DCs were treated with DEX and ASP with or without RU-486 for 6 or 24 h. Cells were lysed and GILZ protein expression was assessed by Western blotting using a rabbit anti-GILZ pAb. Membranes were stained with amidoblack as a loading control. Results are expressed as fold increases in protein expression determined as a ratio between normalized intensities of treated cells and untreated cells. Results are representative of three independent experiments. B, p65 expression was analyzed by Western blotting in DCs incubated for 15, 30, or 60 min with either LPS, DEX, or ASP. C, p65 expression was analyzed by Western blotting in DCs incubated for 30 min with either LPS, DEX, ASP, ASP preincubated with specific protease inhibitors, or heat-inactivated ASP. DCs treated with proteases inhibitors alone were used as controls.